This 5-week drawing course for ages 9-14 will focus on techniques used to introduce, develop, and improve drawing skills for children who are serious about drawing. Each week, we will work on specific skills to build a "tool box" for the artist's individual preferences or needs with a focus on skills such as gesture drawing or contour drawing. Students will combine their drawing skills to create a colorful, spectacular animal portrait. Students will be given "homework" to practice and reinforce skills learned in class. Note: Tuition for this 5-week drawing course is $175. However, every student who enrolls will receive a $30 scholarship, making the family co-pay only $145 per session. The fee includes all supplies needed to complete projects and daily snacks. WHEN YOU GET READY TO REGISTER ONLINE, PLEASE NOTE THAT WE HAVE ALREADY ADJUSTED THE PRICE TO REFLECT YOUR SCHOLARSHIP. Classes meet on Saturdays from Noon to 2 p.m.
FEE: $145* per child per 5-week course, includes use of all supplies plus a snack. *Note: Regular price for this 5-week course is $175. However, each child will receive an automatic scholarship of $30 toward the tuition for each session they are enrolled in making the final fee $145. 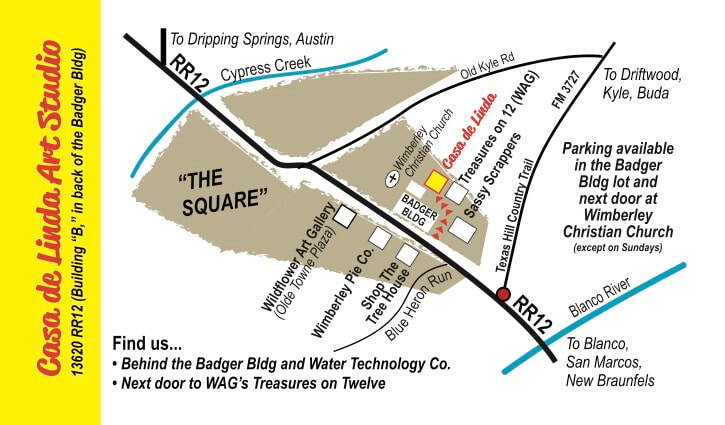 These scholarships are made available from grants provided to the New Braunfels Art League by members and benefactors. Dozens of children have taken our basic drawing courses and camps over the years and many are now ready for the next level. 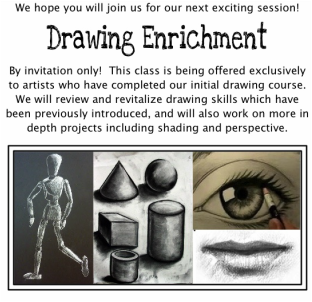 If your son or daughter is between the ages of 9 and 14 and has completed a drawing course or summer camp with Ms. Elaine in the past, they they are eligible for this new "Drawing Enrichment" course being offered for the first time. This 5-week course will pick up where the previous courses/camps left off. In addition to reviewing previous lessons, students will work on more in-depth skills to improve their drawings. This course is only open to repeating Casa de Linda students who have taken a drawing class or camp with Ms. Elaine. First-time students need to enroll in the Draw, Draw, Draw! course first. Note: Tuition for this 5-week DRAWING ENRICHMENT course is $160. However, every student who enrolls will receive a $30 scholarship, making the family co-pay only $130 per session. The fee includes all supplies needed to complete projects and daily snacks. WHEN YOU GET READY TO REGISTER ONLINE, PLEASE NOTE THAT WE HAVE ALREADY ADJUSTED THE PRICE TO REFLECT YOUR SCHOLARSHIP. Classes meet on Saturdays from 2:15-3:45 P.M.
FEE: $130 per child per 5-week course, includes use of all supplies plus a snack.